Hawaiian Holdings stock rose on Friday following yet another strong earnings report. Meanwhile, Volaris stock plunged after the company reported a big Q1 loss. 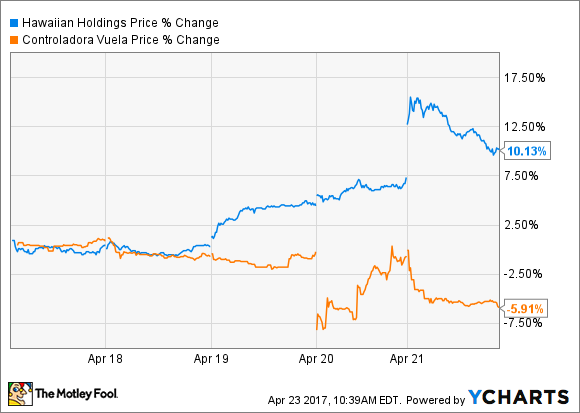 Hawaii-focused leisure carrier Hawaiian Holdings (NASDAQ:HA) and Mexican budget airline Volaris (NYSE:VLRS) both released their first-quarter results on Thursday. The Hawaiian Airlines parent reported strong earnings growth for Q1. Indeed, it was one of the few airlines to expand its profit margin last quarter despite the impact of rising fuel and labor costs. Meanwhile, Volaris posted a big loss for the quarter, brought down by rising costs and pockets of demand weakness. Not surprisingly, Hawaiian shares rallied on Friday, while Volaris stock tanked. Hawaiian Holdings and Volaris Weekly Stock Performance, data by YCharts. The divergence in the two carriers' results is indicative of the different trends in their main markets. Hawaiian Airlines is flying high because of strong demand for travel to Hawaii, while Volaris is struggling because of a slowdown in travel from Mexico to the United States. In 2016, Hawaiian Airlines' revenue per available seat mile (RASM) rose 2% year over year. This improvement made it the only major U.S. airline to post unit revenue growth last year. As a result, Hawaiian now faces tougher revenue comparisons than its peers do. Nevertheless, it continues to outpace the rest of the industry by a wide margin. In Q1, RASM soared 7.6%, easily beating the company's original guidance for a 4%-7% increase. By contrast, most other airlines have reported flat or declining unit revenue for the first quarter. This strong unit revenue growth allowed Hawaiian Airlines to fully offset a 6.5% increase in its economic fuel cost per gallon and a 6.7% jump in its non-fuel unit costs. The company's adjusted pre-tax margin increased 0.7 percentage points year over year to 13.3%. Hawaiian expects the strong revenue momentum to continue in the second quarter, with RASM up 5.5%-8.5%. That's good, because the company has forecast that non-fuel unit costs will be up 4.5%-7.5% and its economic fuel cost per gallon will rise to a range of $1.65-$1.75 from $1.55 a year earlier. Hawaiian Airlines expects its revenue momentum to continue in Q2. Image source: Hawaiian Airlines. While analysts have been predicting that Hawaiian Holdings' earnings would decline in 2017, the company's forecast suggests that it may be able to at least hold EPS steady, despite facing big cost headwinds. This situation would put it in great position for 2018, when cost headwinds should start to abate and Hawaiian's growth will accelerate as the ultra-efficient A321neo enters its fleet. In contrast to Hawaiian Holdings, Volaris posted very weak results last quarter. On one hand, rising fuel prices and the weak peso are driving huge unit cost increases. Thus, Volaris' unit costs, measured in pesos, surged 26.6% year over year last quarter. On the other hand, uncertainty related to changes in U.S. visa and immigration policy drove a sharp slowdown in demand for travel from Mexico to the United States. A shift in the timing of Easter, which fell in March in 2016, also hurt demand last quarter. As a result, Volaris posted a 6.6% year-over-year decline in unit revenue. The net result was that Volaris' operating margin plunged to negative-13.7%, down by 30 percentage points year over year, leading to a big loss. Volaris lost money last quarter. Image source: Volaris. In Q2, Volaris will benefit from the Easter shift. Furthermore, demand for travel from Mexico to the U.S. is recovering, while the peso has recouped some of its losses in the past three months. Lastly, Volaris has reduced its capacity growth plans for the rest of the year. These factors should lead to much better financial performance in the coming quarter. While Volaris still expects its profit margin to contract on a year-over-year basis, its forecast implies that operating income will be roughly breakeven. Despite having soared more than 15% in the past few weeks, Hawaiian Holdings stock has plenty of upside. The stock trades for about 10 times trailing earnings, and the arrival and expansion of its A321neo fleet gives it plenty of room to grow EPS in the years ahead. As for Volaris, while the company is clearly struggling right now, it has already shown great resilience in its relatively short life as a public company. Demand is starting to improve, and the recent strengthening of the peso means that currency headwinds will start to fade this quarter and could disappear entirely by the second half of the year. Furthermore, Volaris' cost advantages over its main rivals in Mexico position it to generate strong profits in the long run. Thus, patient investors shouldn't give up on Volaris, despite the recent volatility of its earnings.